The potlatch ceremony, as practiced by the Tlingit (as well as many other indigenous groups in the Pacific Northwest and Canada2), centers on gift-giving. Potlatches take place for a variety of reasons, ranging from births and deaths to weddings and house building. Often replete with dancing, singing, storytelling, and the distribution of gifts, an important aspect of these lavish celebrations is the communal feast, to which such baskets contribute. 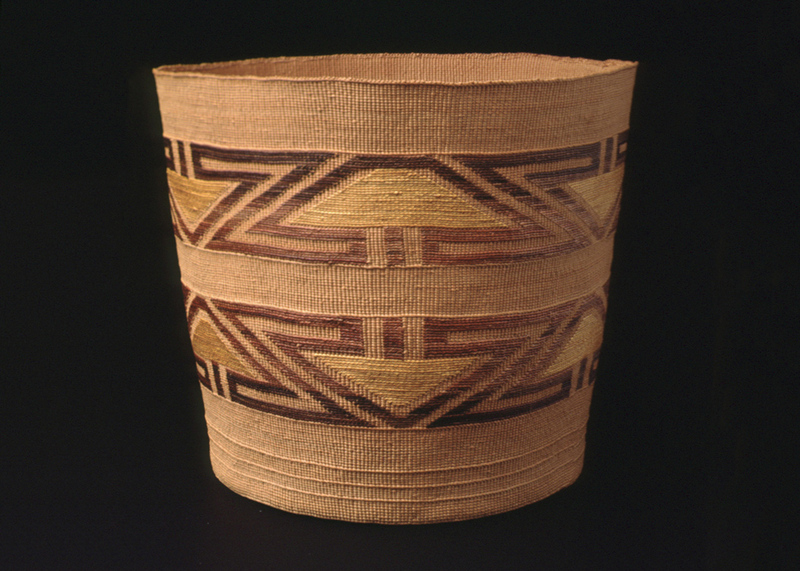 As both a practical and aesthetic object, this berrying basket features a traditional Tlingit embroidery design identified as “head of salmon berry,” a modern motif likely copied from an oil cloth pattern.3 Decorative yellow triangles and trapezoids punctuate the zigzagging black and brown bands. Slightly wider than it is tall, flared baskets such as this would be used to collect berries by knocking them right off the bush. While the imagery of baskets overflowing with corn, squash, and grapes might appear hackneyed during these autumn months, food plays an undeniably central role in our social gatherings. Whether your get-togethers take years to plan (as is the case with some potlatches! ), a few weeks, days, or hours (there is no shame in take-out . . . ), these celebrations with friends and family surely incorporate enough food to fill a berrying basket, many times over. 1 This basket in particular was one of many produced in the late 19th and early 20th centuries, sold as souvenirs to tourists. Though derivative of traditional Tlingit berry and cooking baskets, it features the traditional geometric embroidery designs developed by the Tlingit. 2 This includes the Haida, Kwakwaka’wakw, Makah, Nuxalk, and Tsimshian, to name only a few. 3 Frances Lackey Paul, Spruce Basketry of the Alaska Tlingit (Lawrence, Kansas: Haskell Institute, 1944).